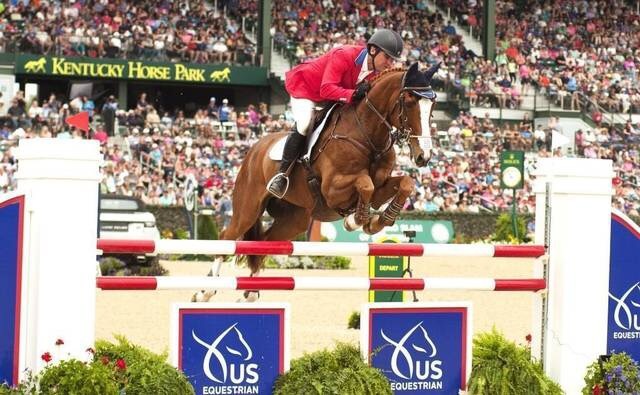 German rider Michael Jung and his mare fischerRocana FST pulled off a third consecutive win at the Rolex Kentucky Three Day Event, the first time that milestone has ever been achieved. Virginian Kim Severson won Rolex three times aboard Winsome Adante, but not consecutively. British rider William Fox-Pitt has also won Rolex three times. Jung had such a commanding lead after Saturday’s cross-country competition that even a dropped rail in the stadium jumping phase on Sunday did not knock him out of contention. Saturday’s top three finishers at the Kentucky Horse Park kept their rankings throughout Sunday’s competition: Jung in first, Frenchman Maxime Livio and his horse Qalao des Mers in second, and Zara Phillips Tindall, Queen Elizabeth’s granddaughter, in third place aboard her horse, High Kingdom. Phillip Dutton on Mr. Medicott was the highest placed U.S. rider, in fourth. Dutton’s other two horses, Fernhill Fugitive and I’m Sew Ready finished seventh and 10th, respectively. In all, 80,654 people came to the Kentucky Horse Park this weekend.